The Sanskrit word ‘Ayur’ means life and Vastra means dress. 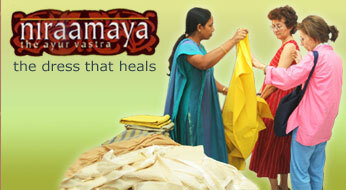 Ayurvastra is the garment that ensures better health and long life. "Ayurvastra" is based on the Ayurvedic principle that regular contact with a cloth made from the yarns infused with organic herbs and medicinal plant extracts will relieve metabolic disorders and threads a new line of healthy living. It is 100 per cent pure cotton or silk handloom fabric made out of dyes using various ayurvedic herbs. It can be used as Ayurvedic treatment for diseases like diabetes, skin infections, hypertension, asthma, arthritis and also for boosting immunity. The clothes have successfully undergone clinical trials in Government Ayurveda College in Thiruvananthapuram. Our showroom is located nearer the Jewish Synagogue, Mattancherry, the famous tourist place in Cochin, Kerala. Click here for location map. You can place your order online. Read more on the mode of payment and method of delivery, Select your choice here.